•They mentioned that the insurance sector shares were negatively separating and thus falling. As an insurer, I was upset. •They were about to finalize the sharing of credit ratings of customers with other institutions. Again, as an insurer, I was happy with this news. Because, I know that the credit rating information is used very effectively in motor insurance pricing in many countries, especially the USA. The market is producing technical loss in motor insurance. I am observing a lot of positive development for the compensation of these losses. For example, I know that the risk selection and modelling of companies is based more and more on “detailed data”. 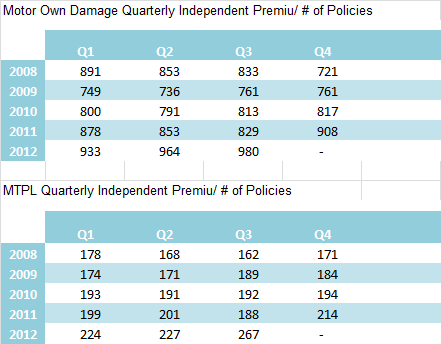 In order to see how these efforts are reflected in product prices, from the data of Turkish Insurance Association, I tried to extract the quarterly development of average prices (*) in motor own damage and MTPL between 2008 and 2012. Result: Average premium in Motor Own Damage and MTPL is increasing.